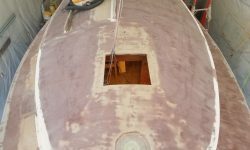 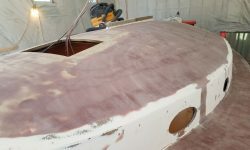 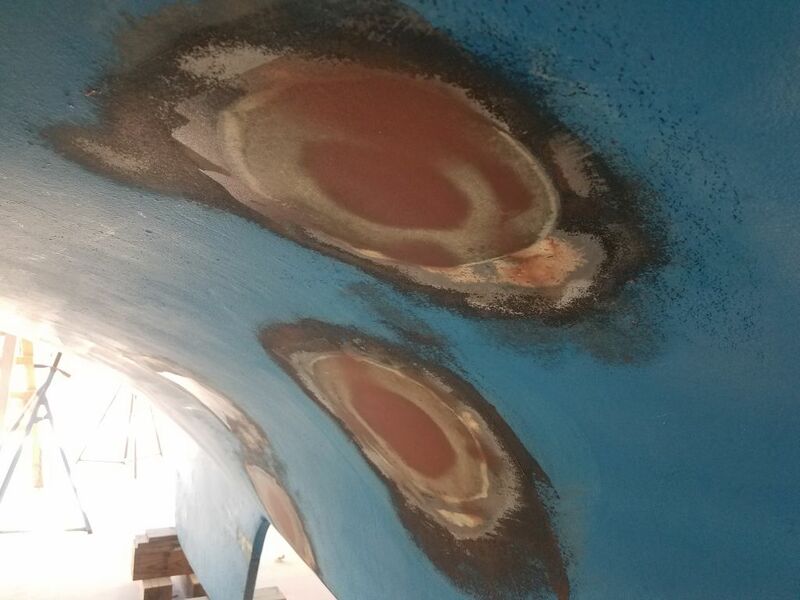 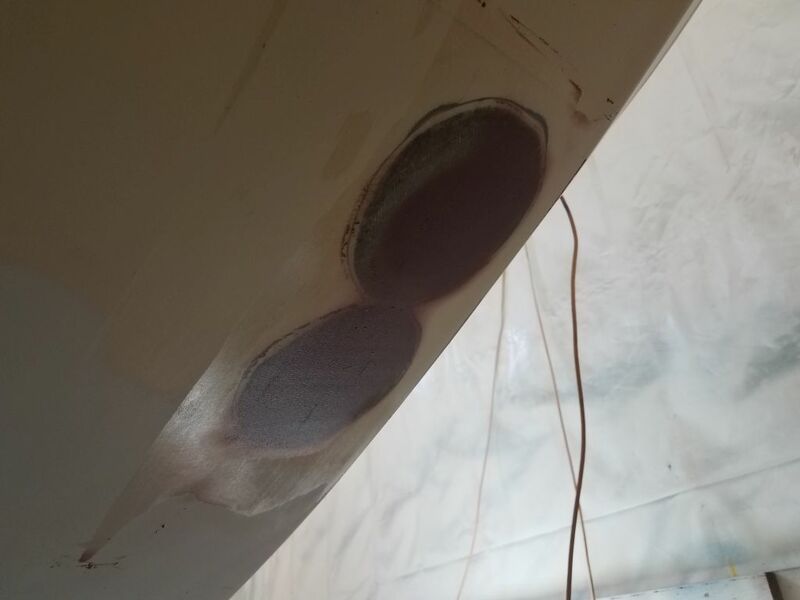 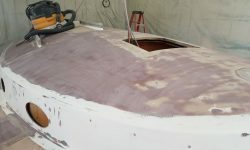 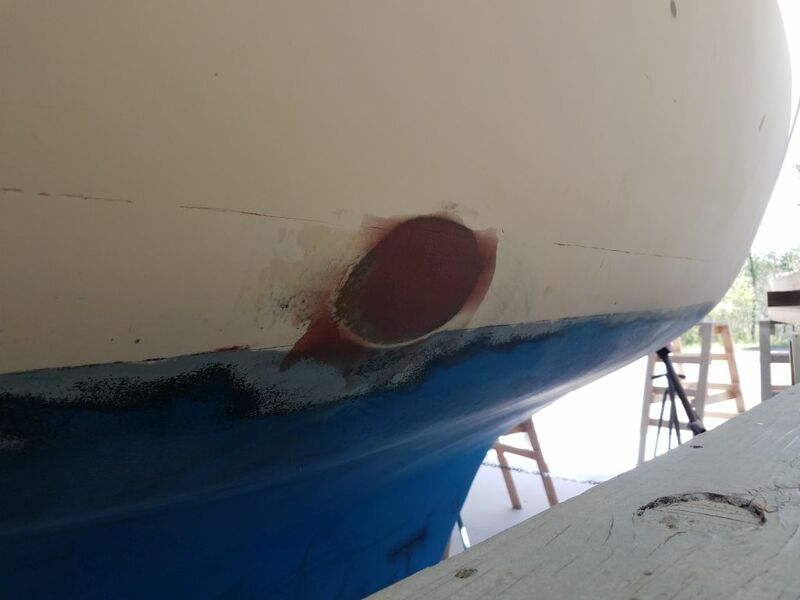 Another day, another round of sanding on deck and on the through hull patches. 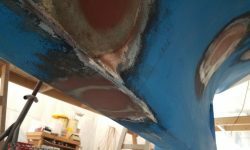 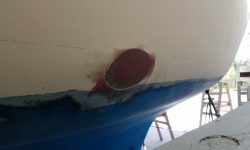 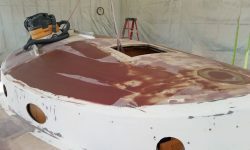 The repairs in the cockpit were looking pretty good after one coat of fairing compound, and the coachroof was getting close on the starboard side, and pretty good to port as well. 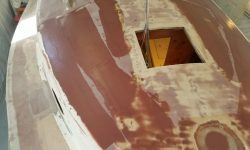 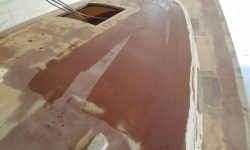 The new repair over the old solar vent hole in the forward coachroof was looking good, and I’d fair it in as I continued work on the adjacent areas. 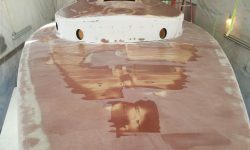 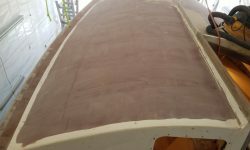 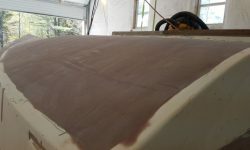 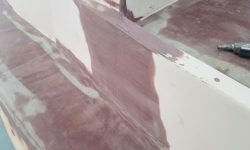 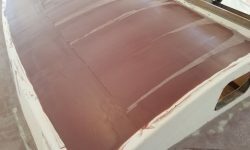 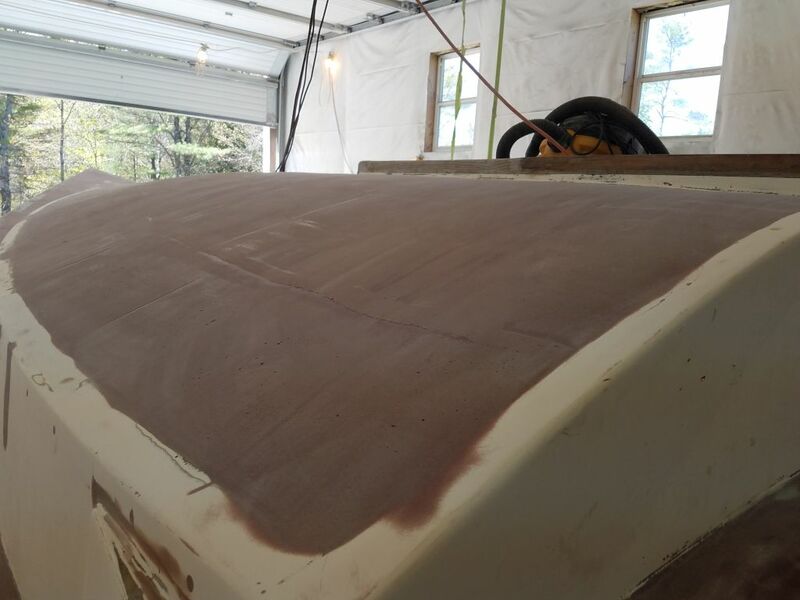 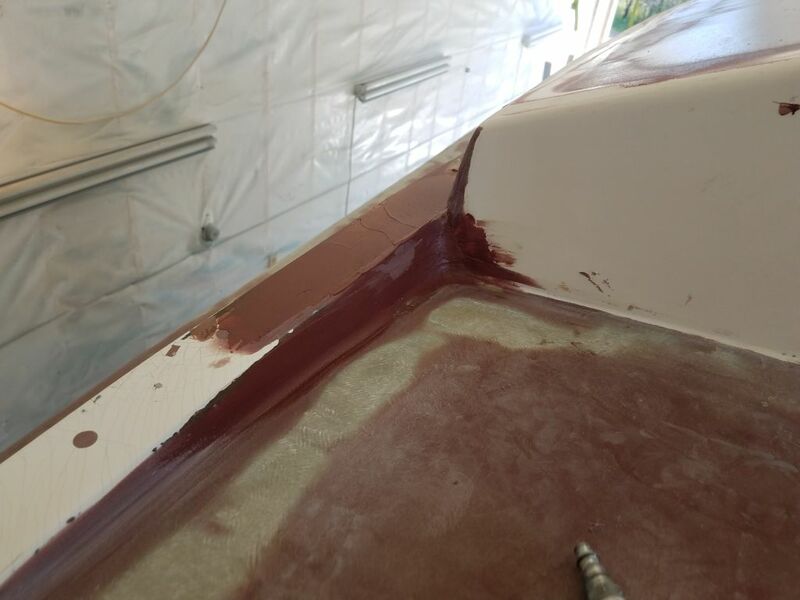 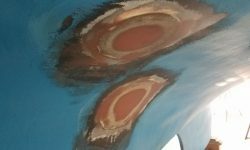 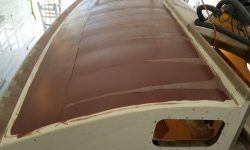 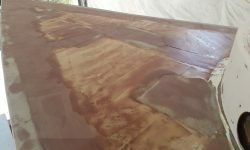 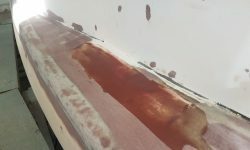 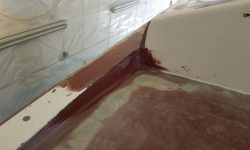 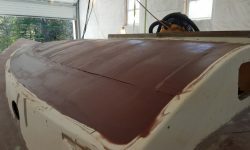 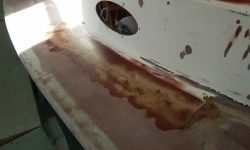 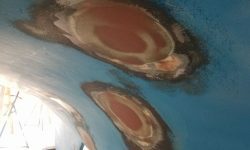 The afternoon was rather disjointed, as my attention was sporadically required elsewhere for some unrelated work going on, but in several shorter sessions I managed to get through what I wanted to for the day, including a third coat of fairing compound on the coachroof. 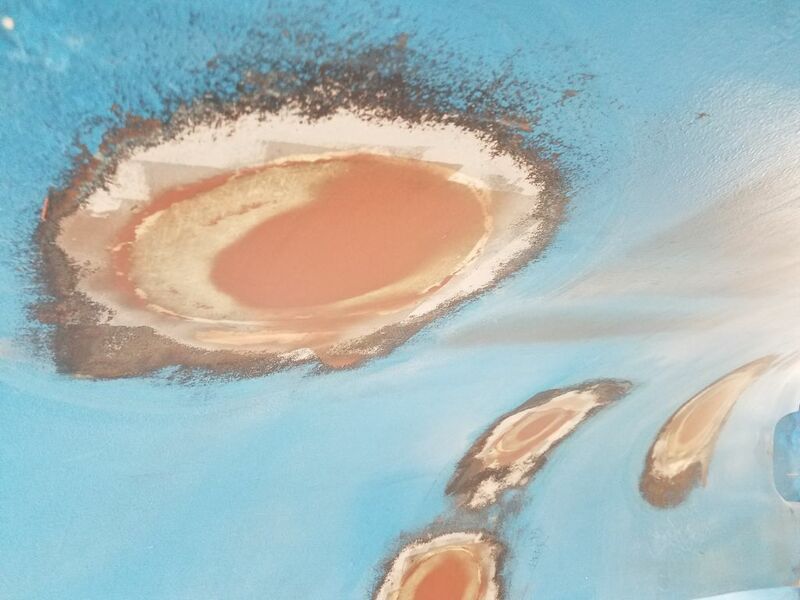 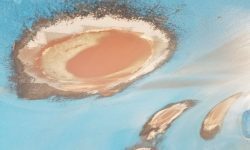 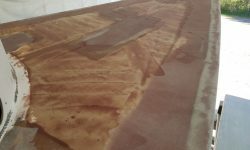 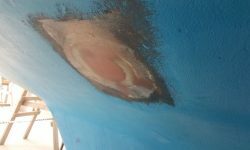 This time, I focused on the known low spots left from last time, and fine-tuning the outer edges of the work area. 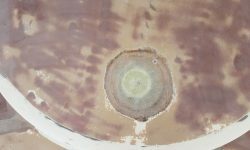 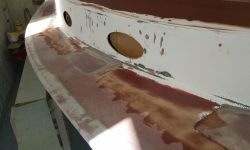 The old instrument and other holes in the cockpit were pretty close after a single coat–in fact, the two smaller holes in the cockpit well required no additional work at this time–but I applied a second coat as needed, along with some additional work on the port coaming repair and solar vent hole. 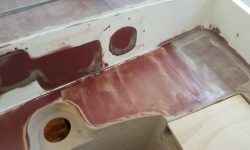 In addition, I skim-coated the molded nonskid areas on the cockpit seats and cockpit well, which areas I’d sanded during the morning’s sanding session to prepare for the finish work now. 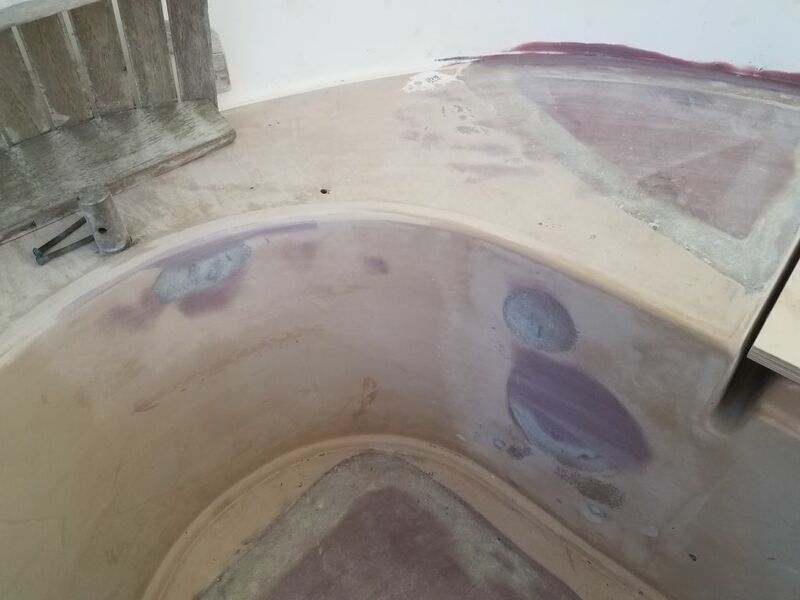 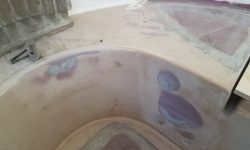 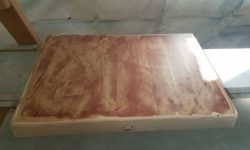 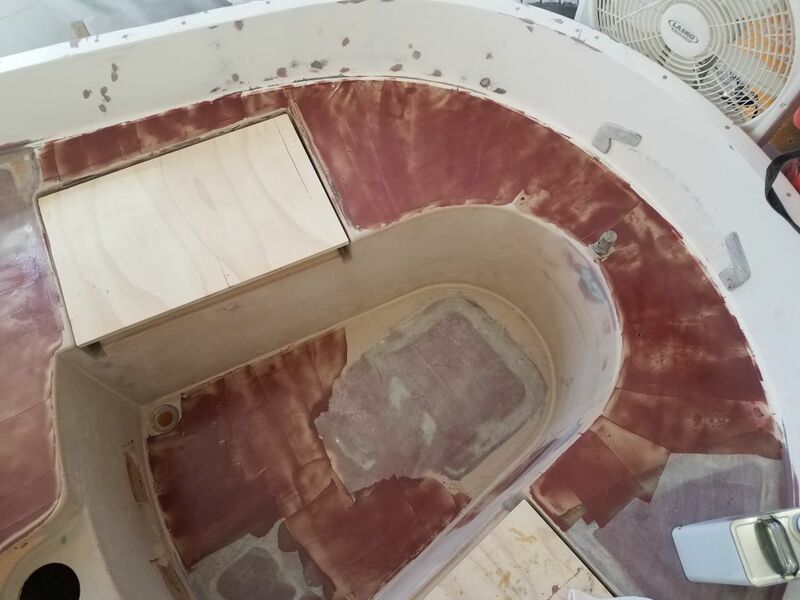 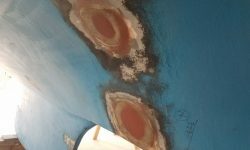 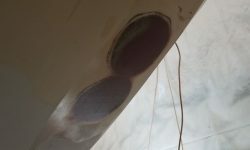 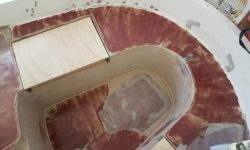 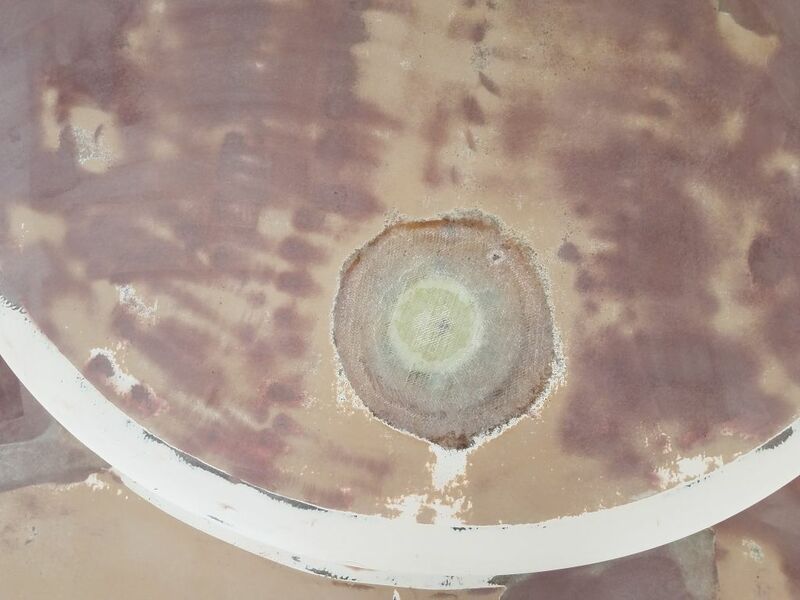 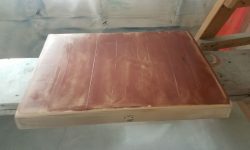 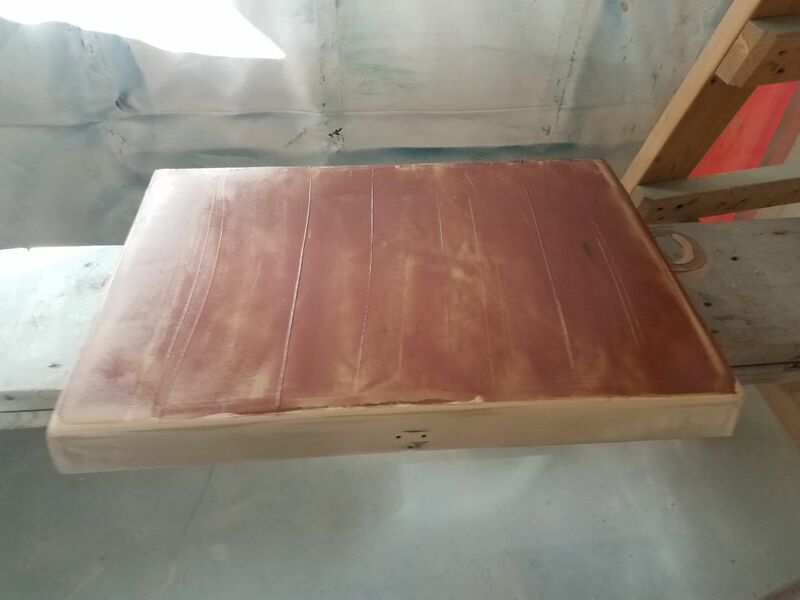 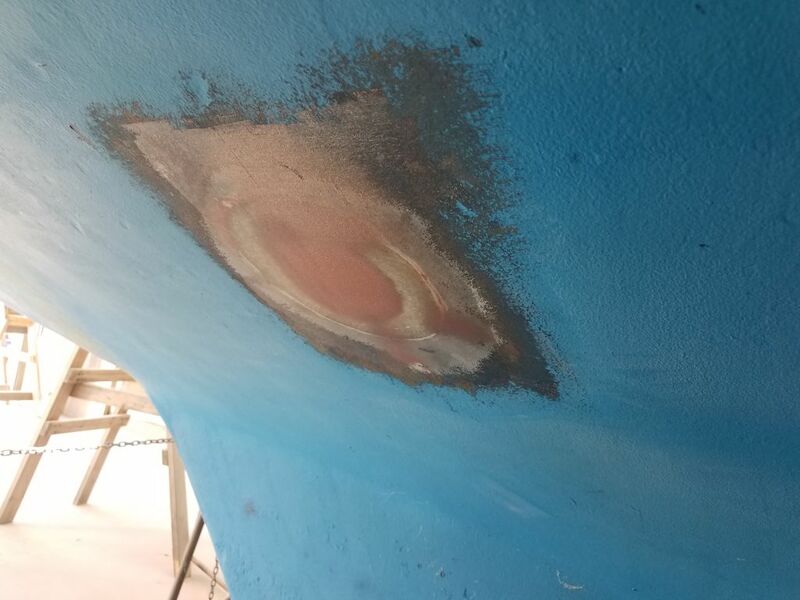 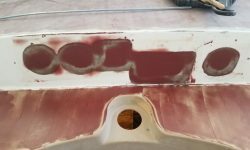 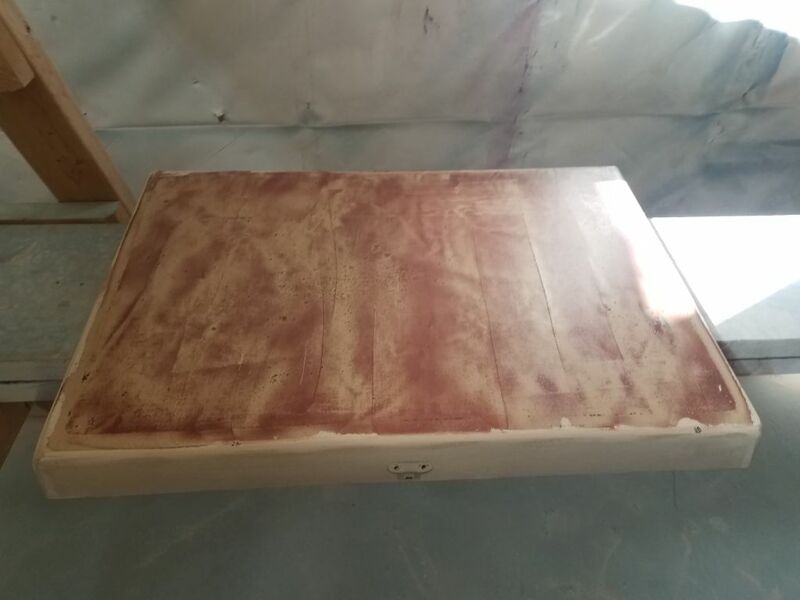 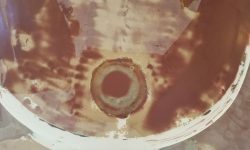 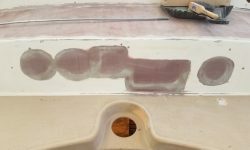 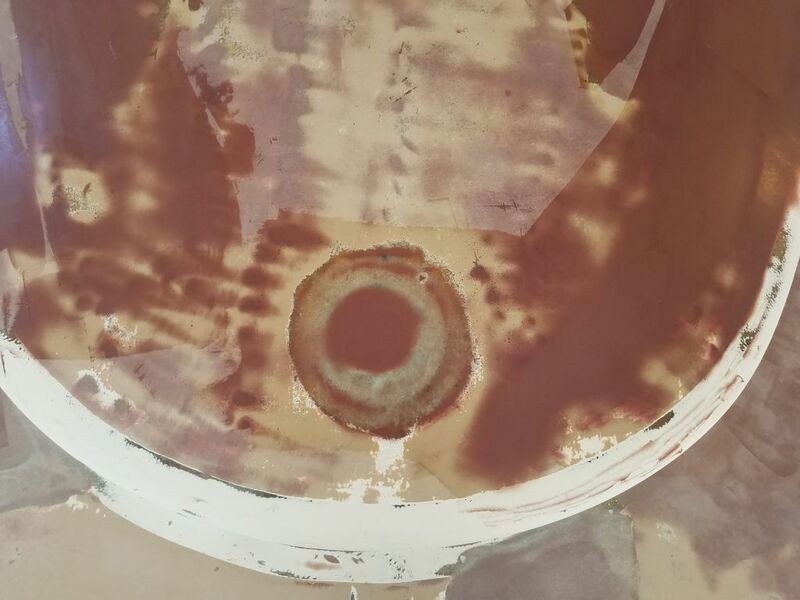 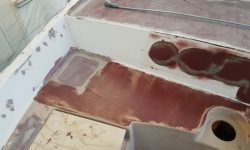 I’d also sanded the two cockpit locker lid hatches to prepare their original surfaces for skim-coating, which I did now. 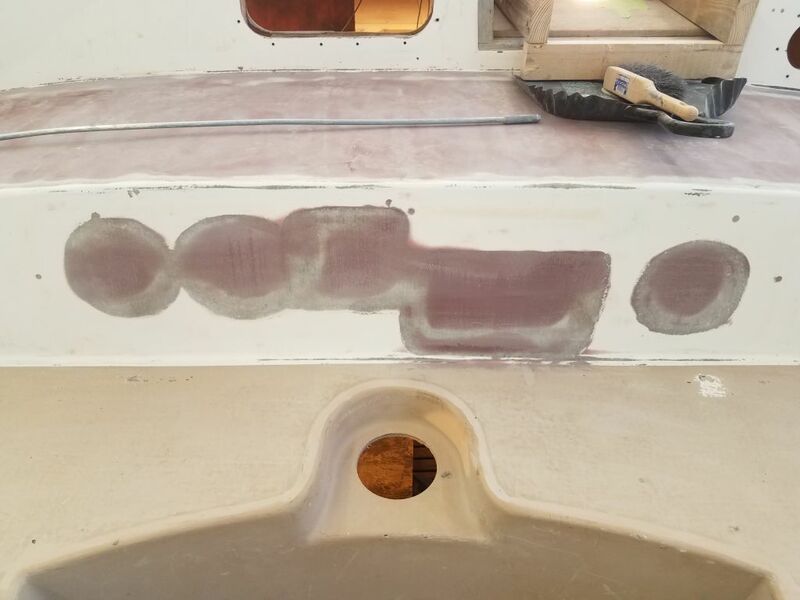 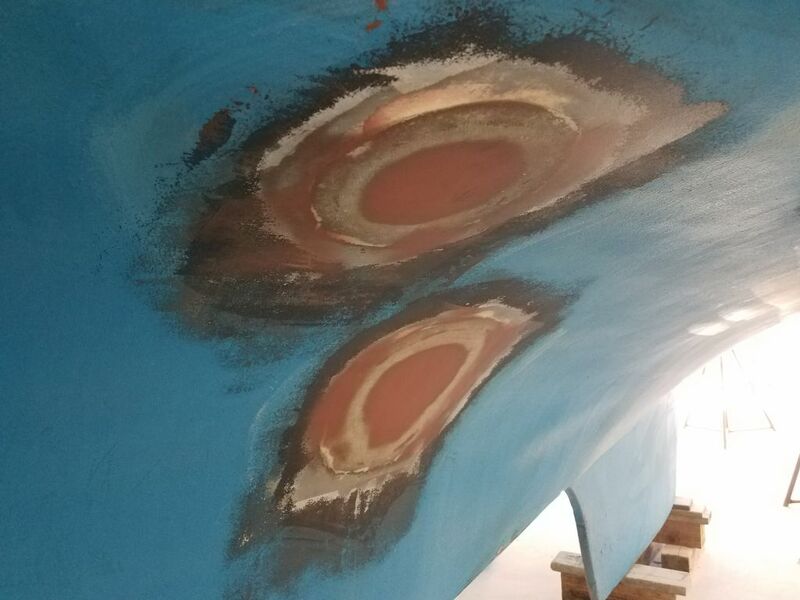 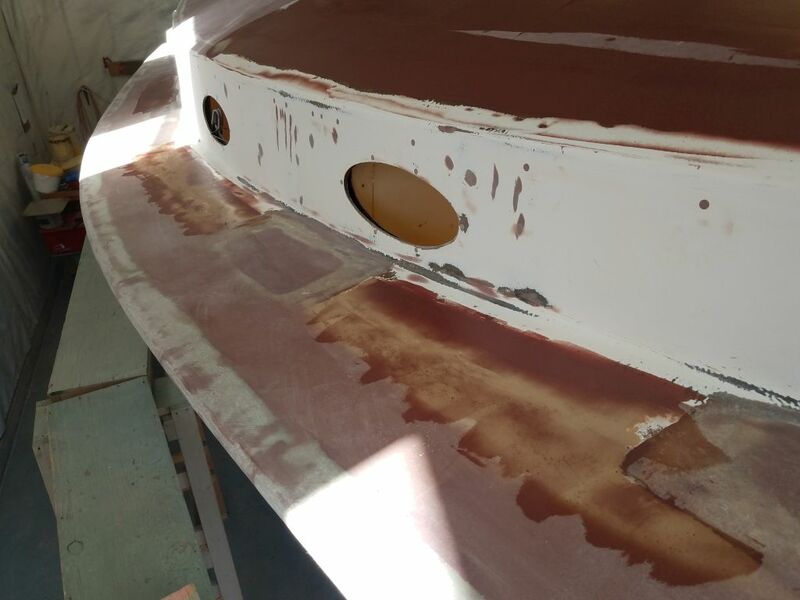 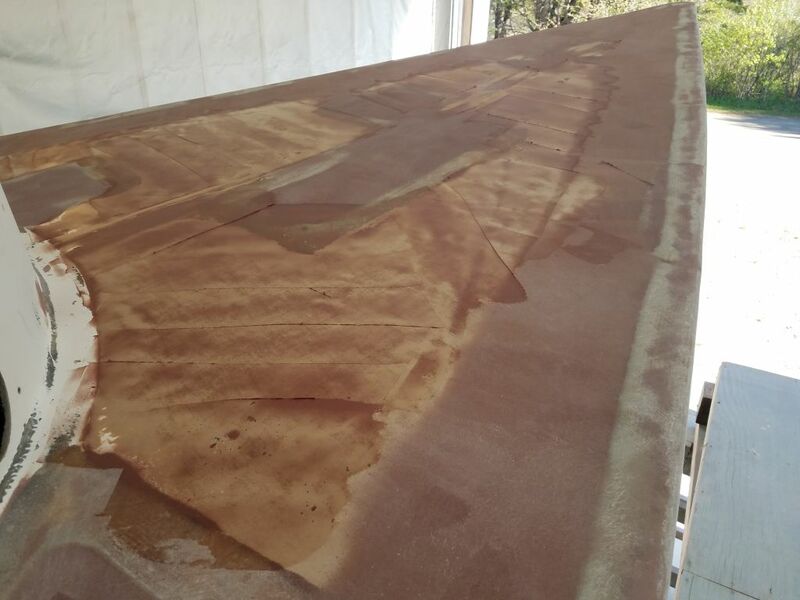 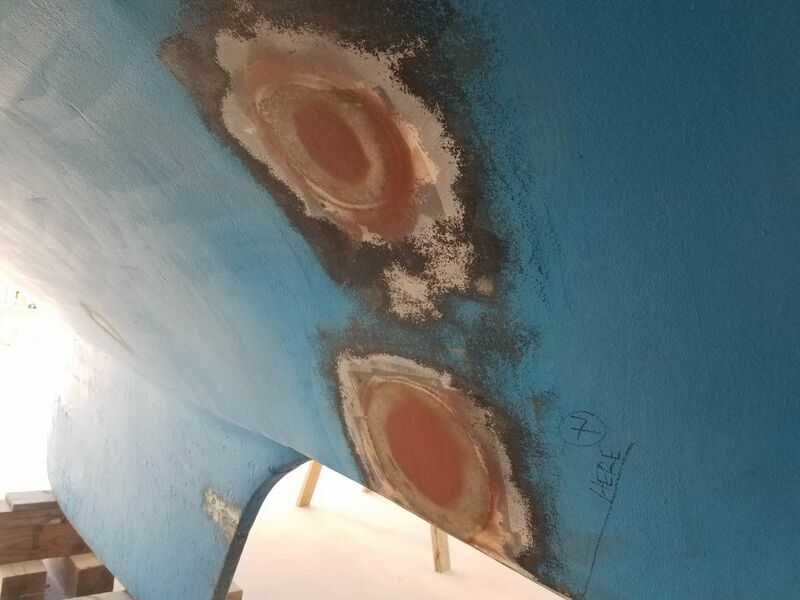 The through hull patches looked good after a coat, and barely needed more attention, but I applied a second coat to all 12 patches regardless. 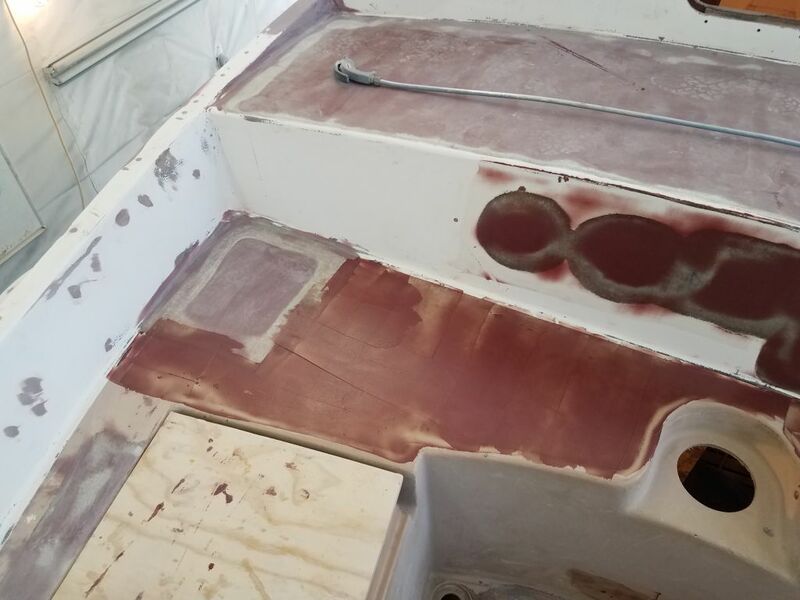 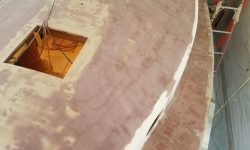 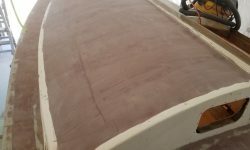 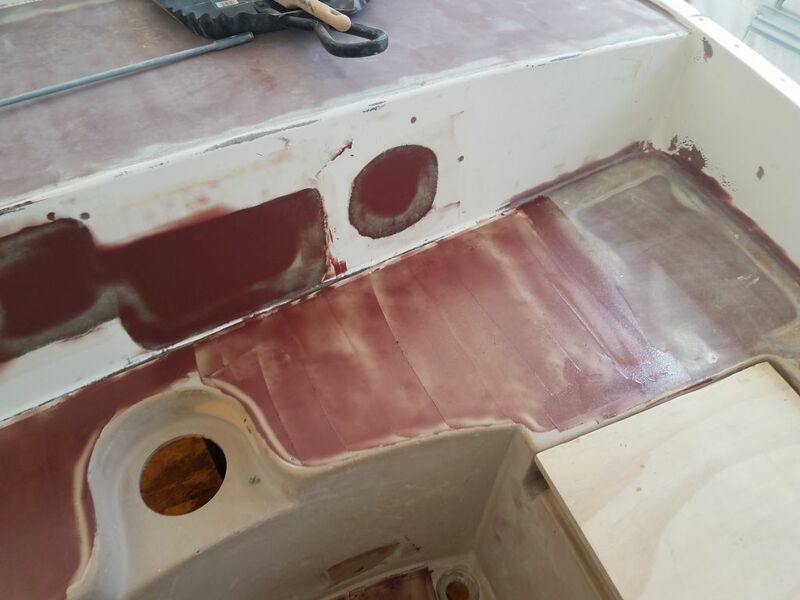 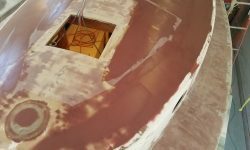 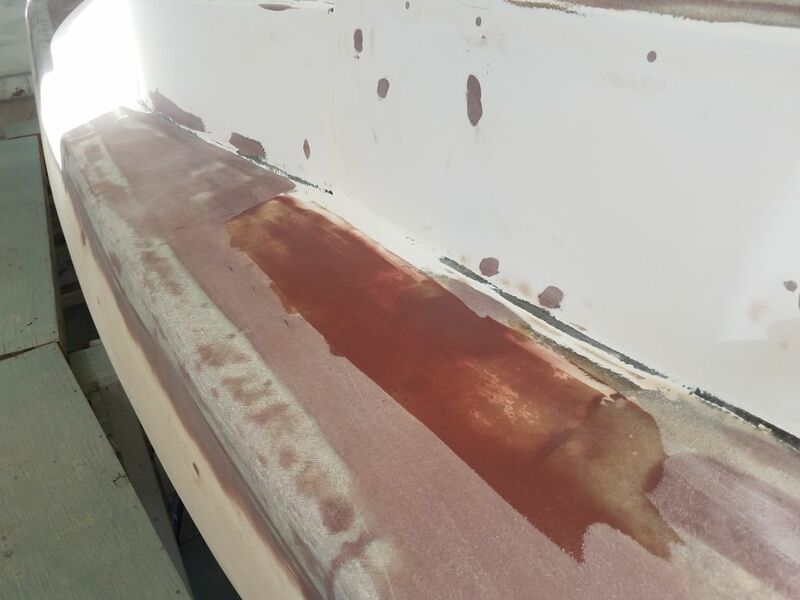 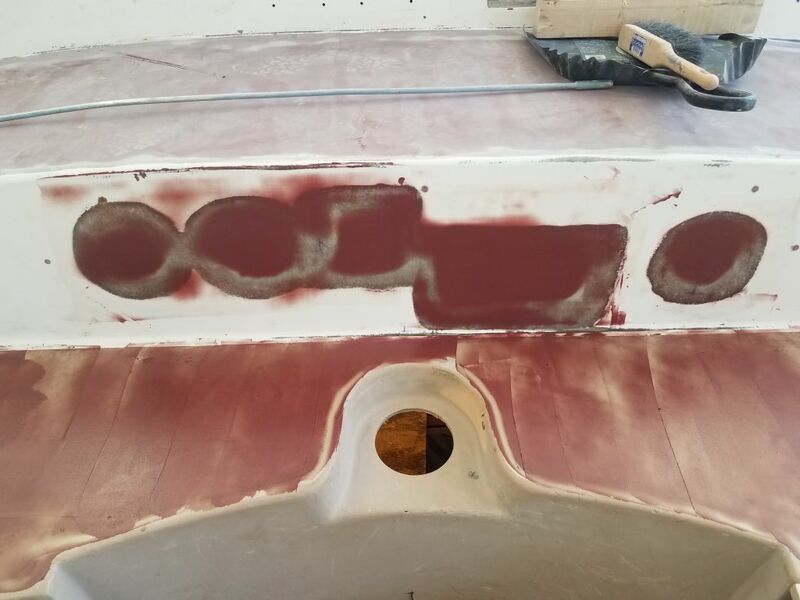 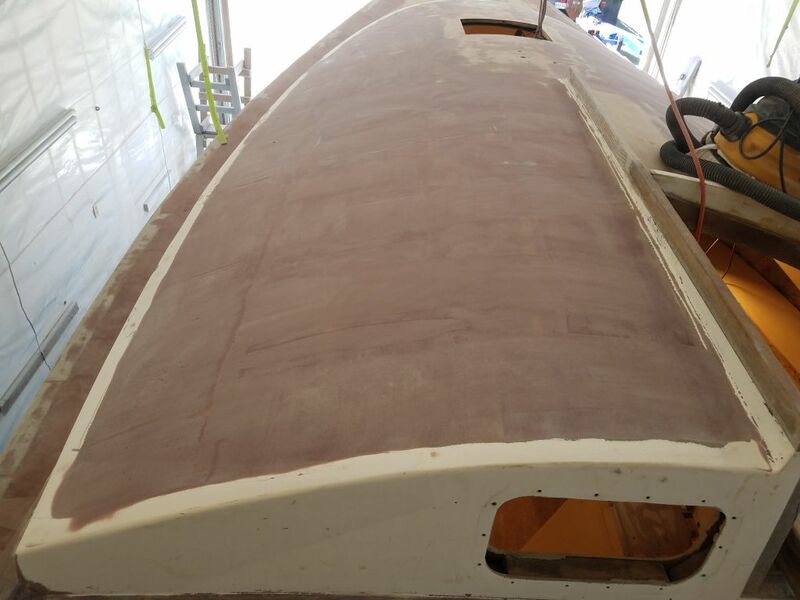 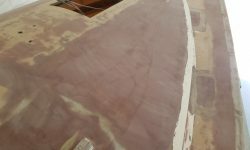 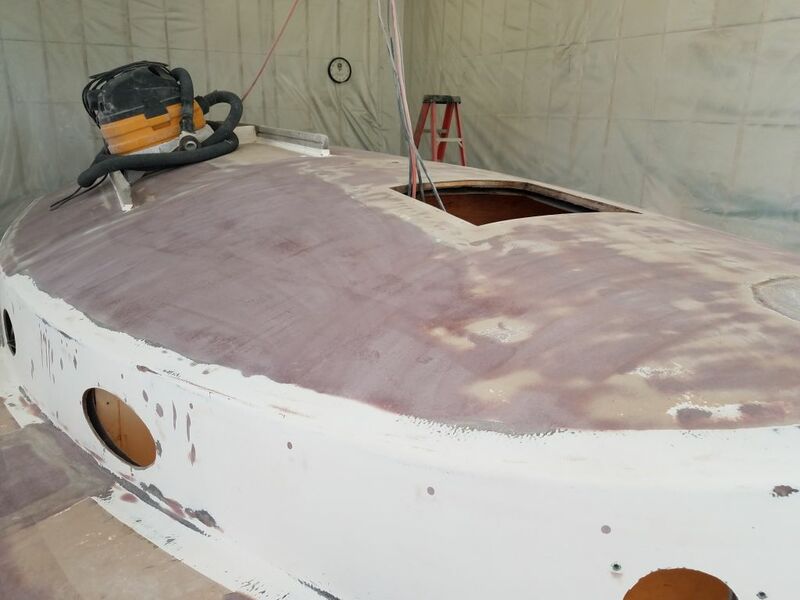 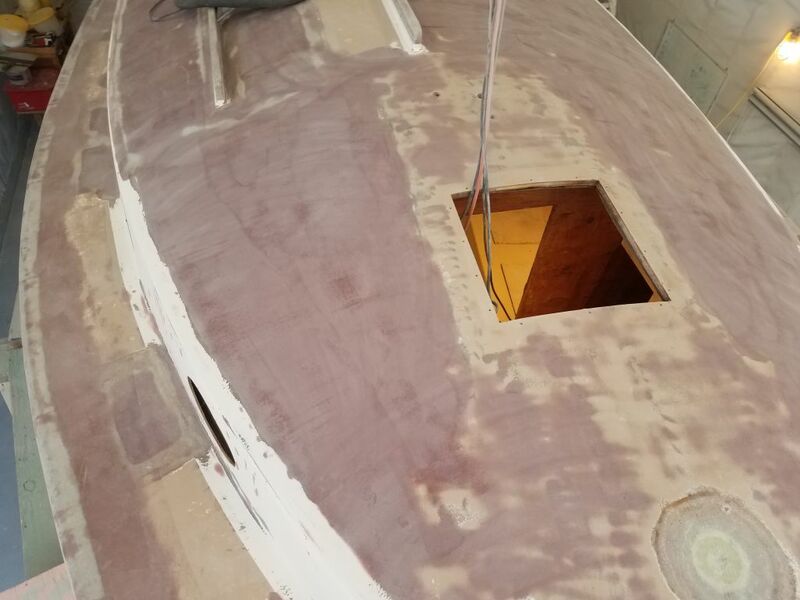 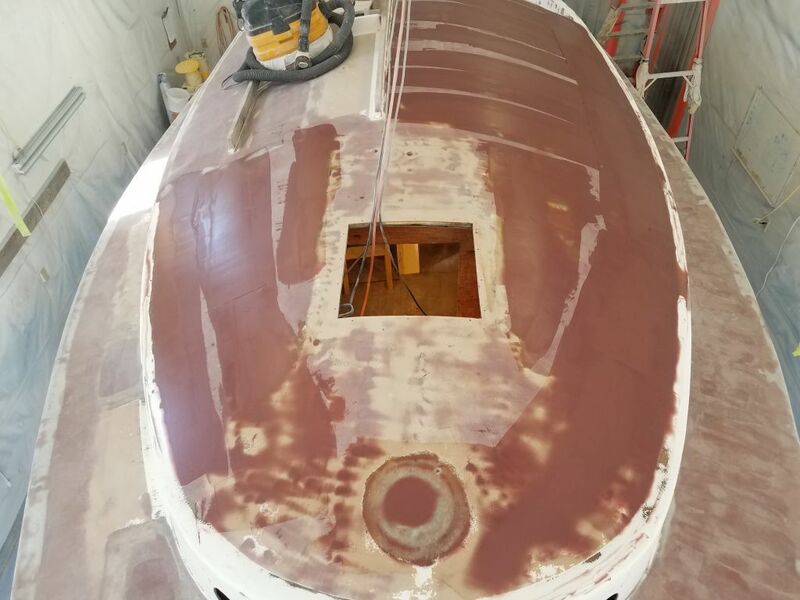 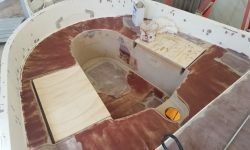 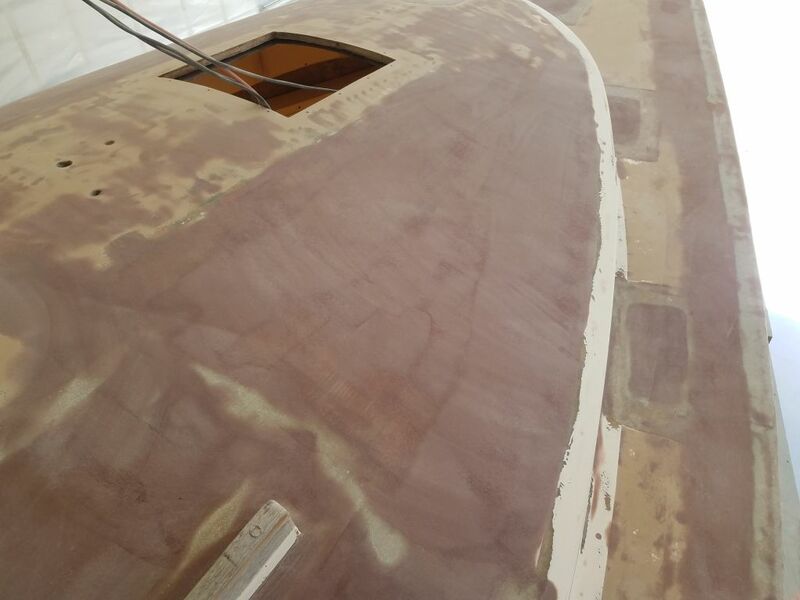 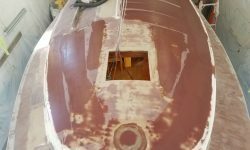 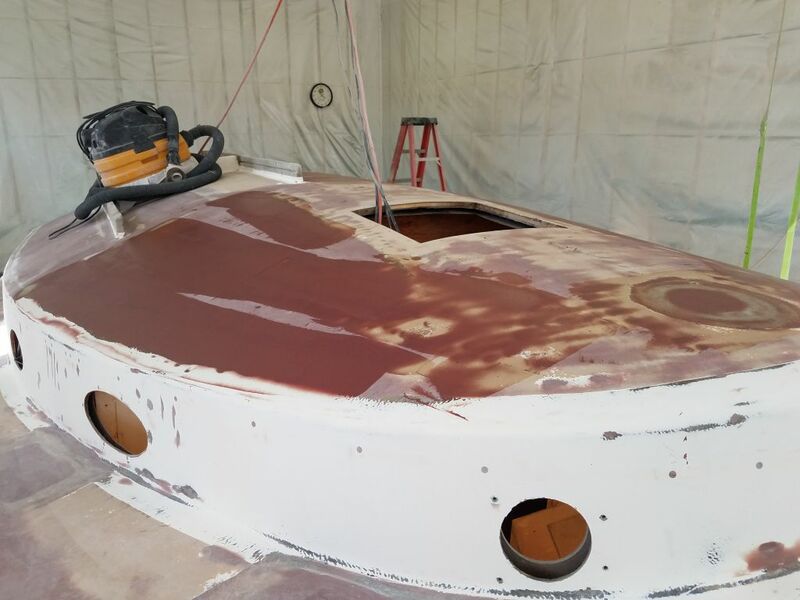 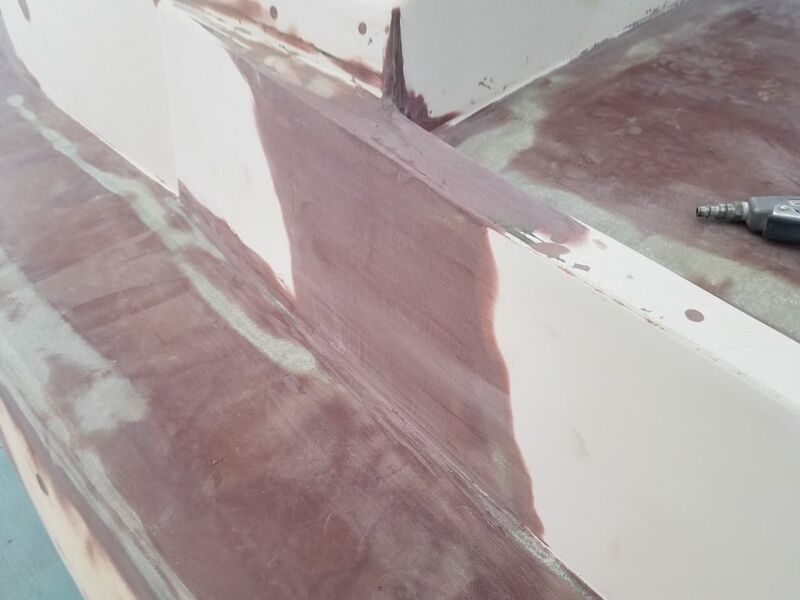 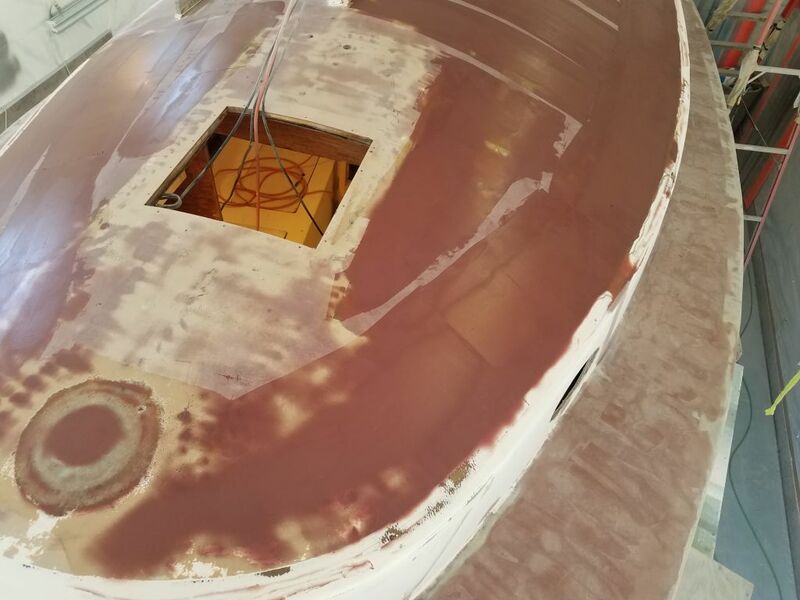 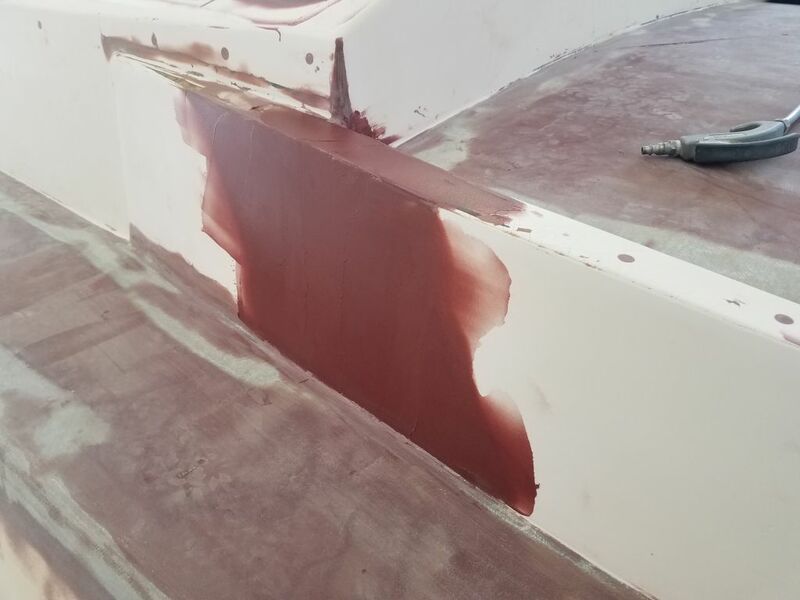 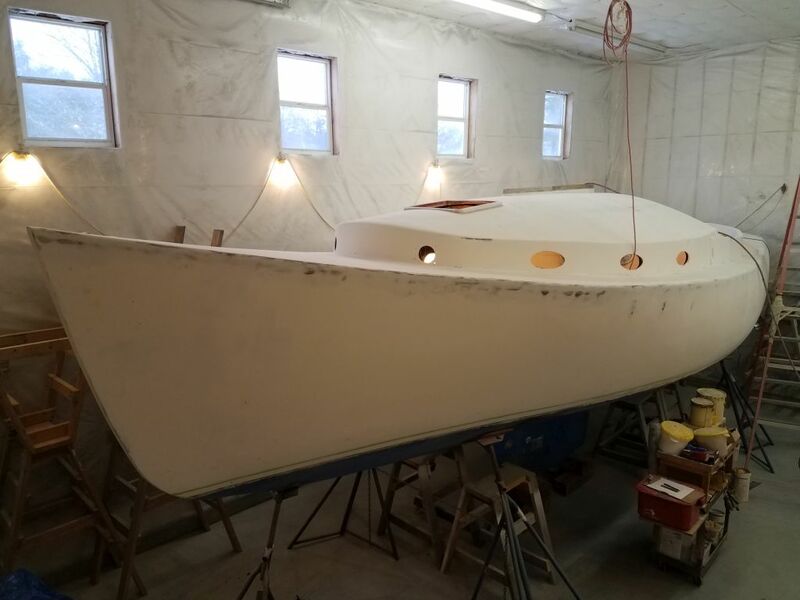 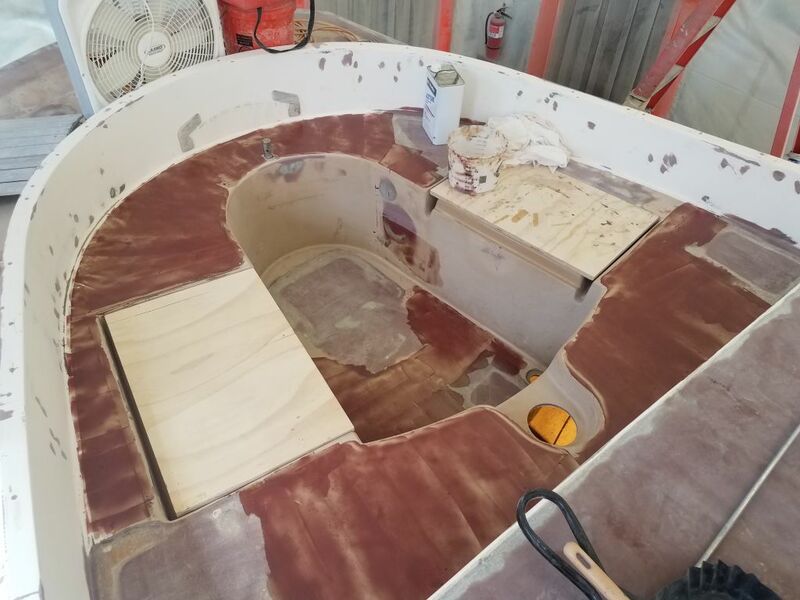 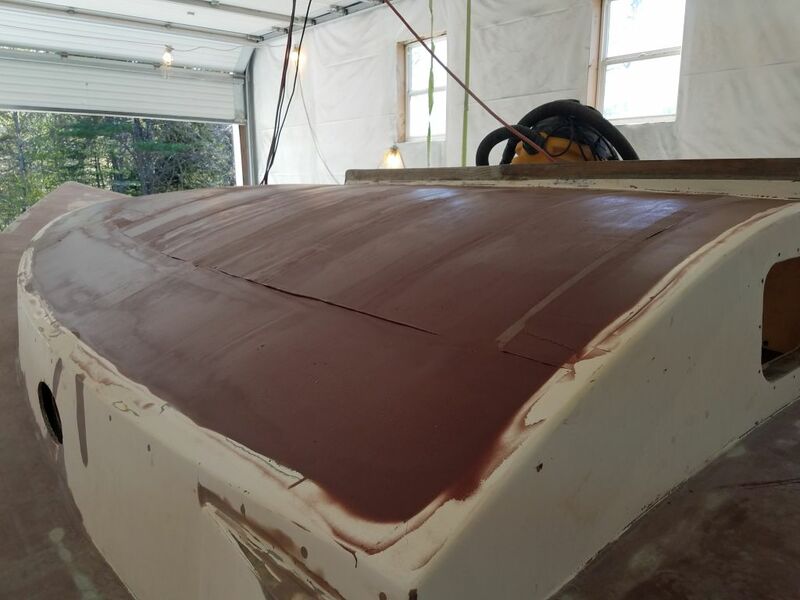 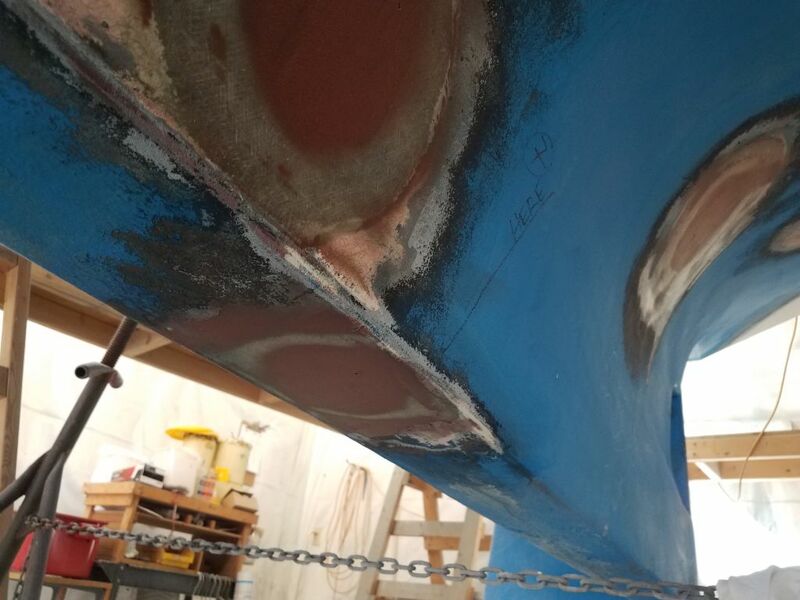 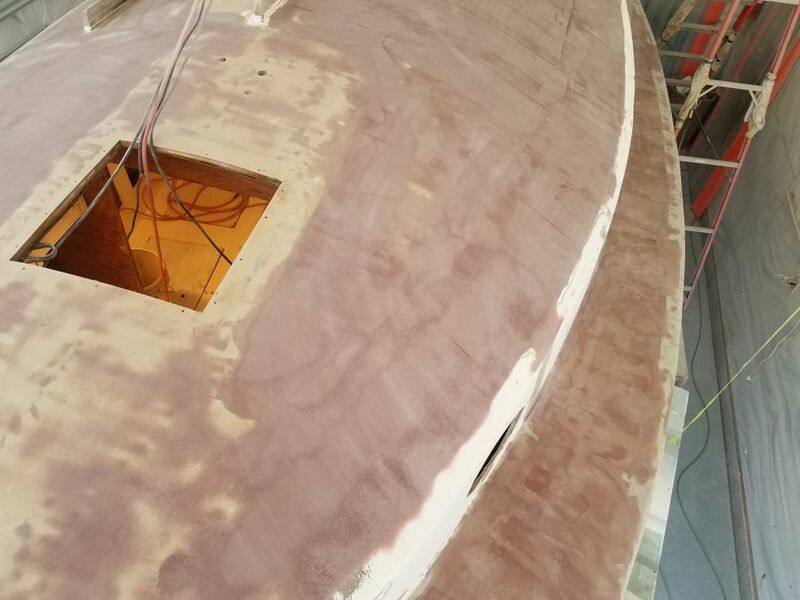 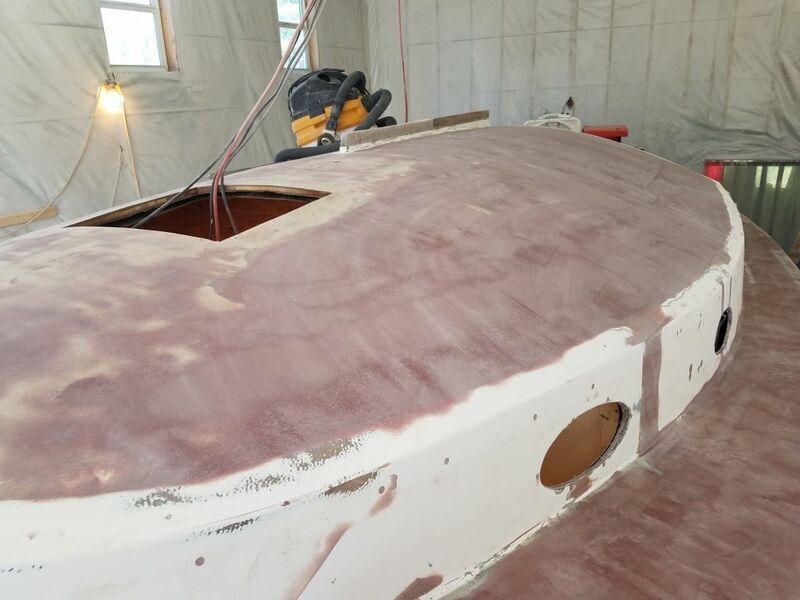 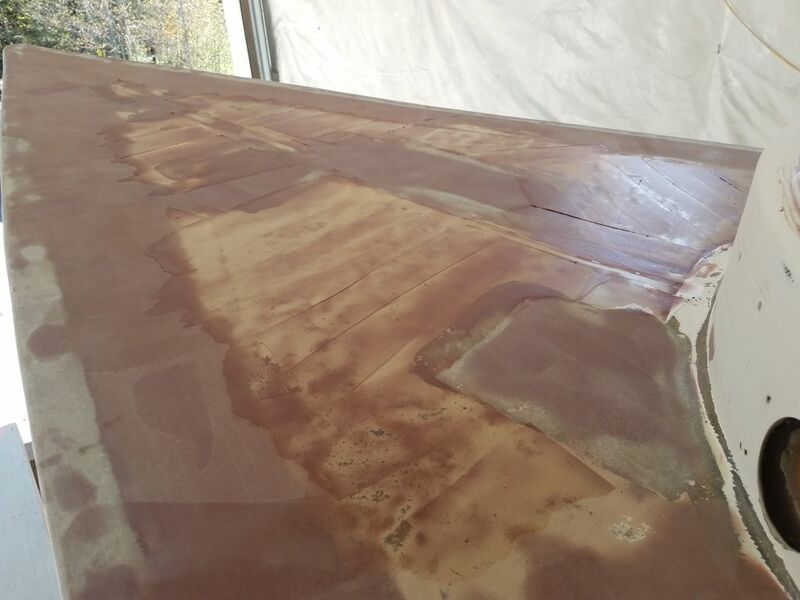 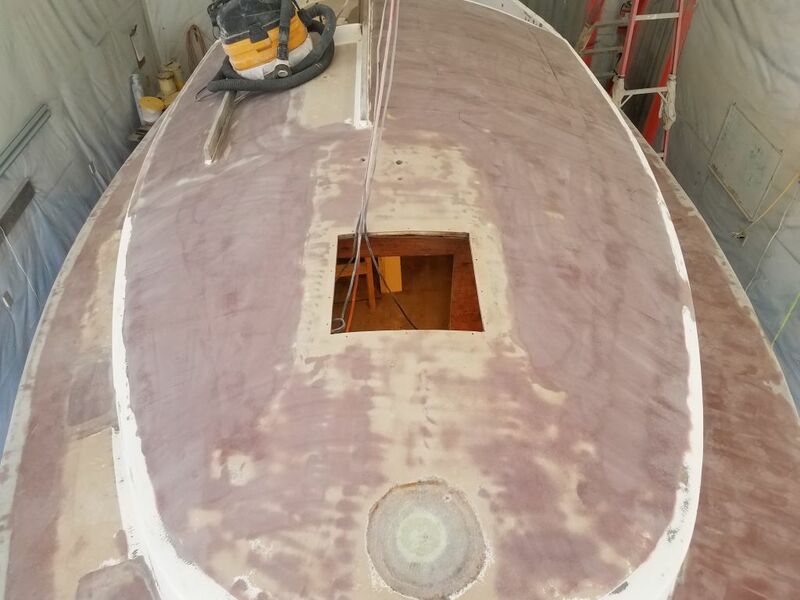 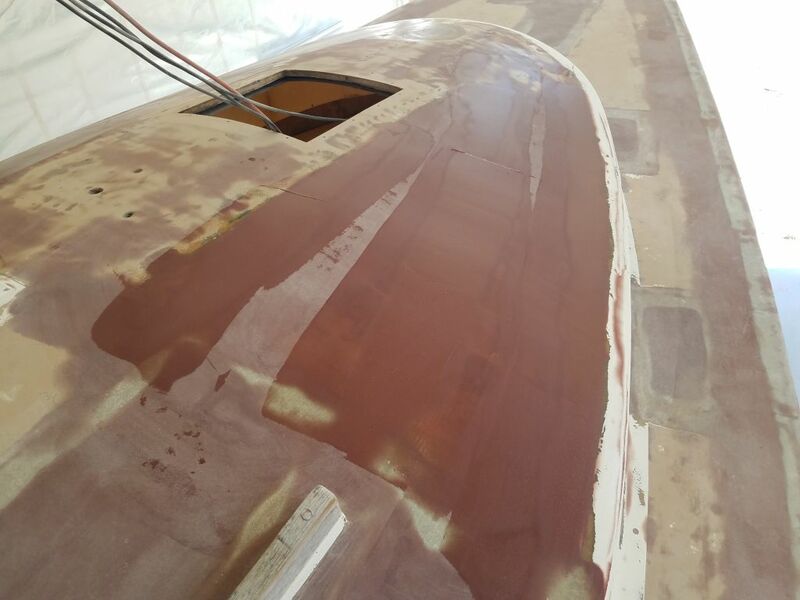 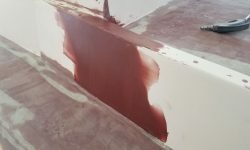 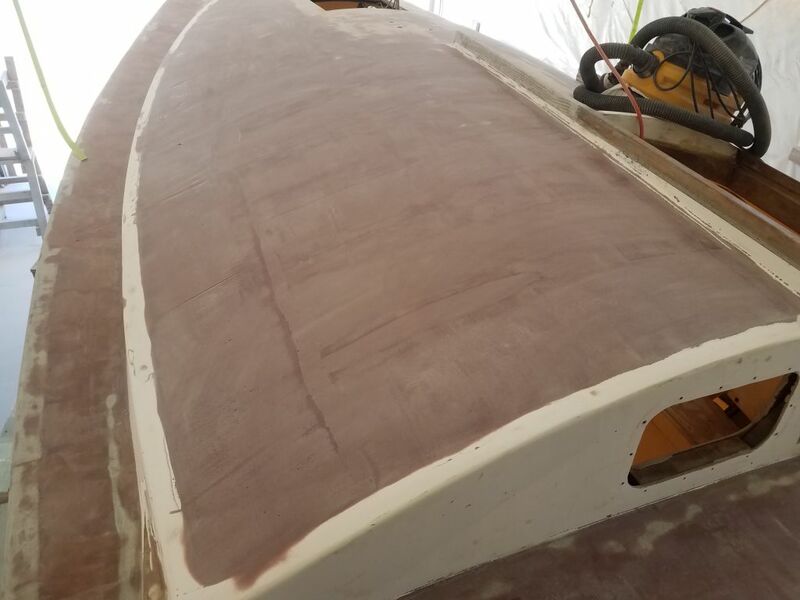 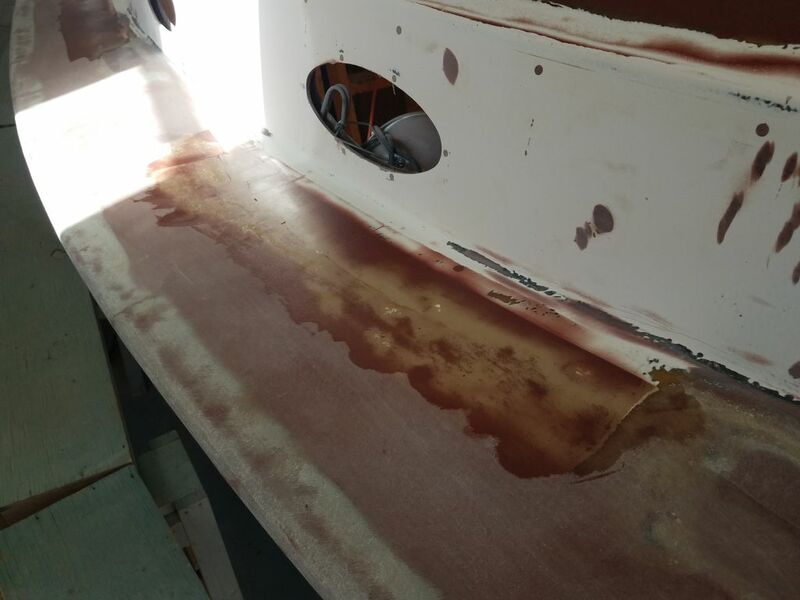 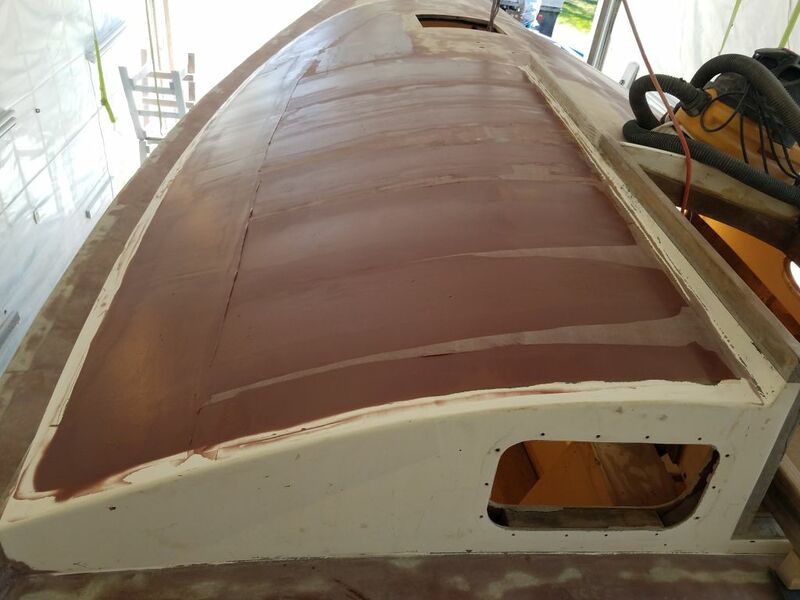 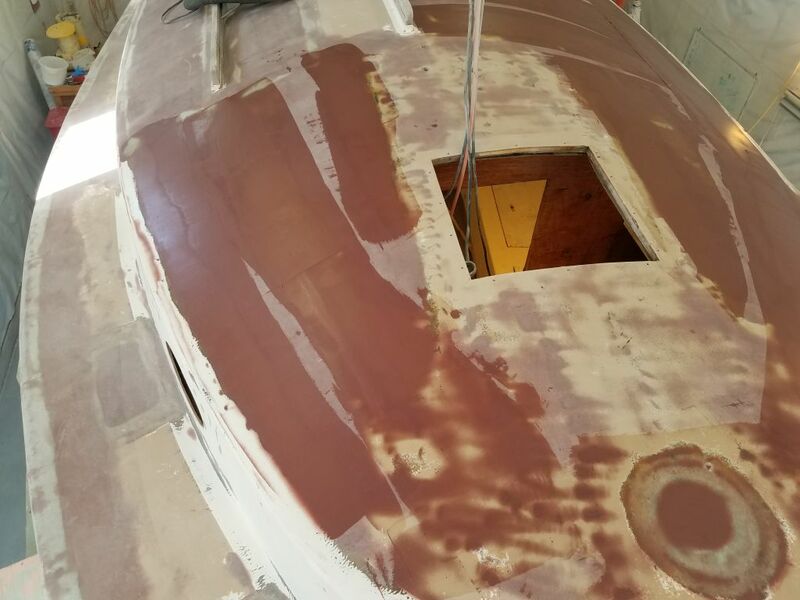 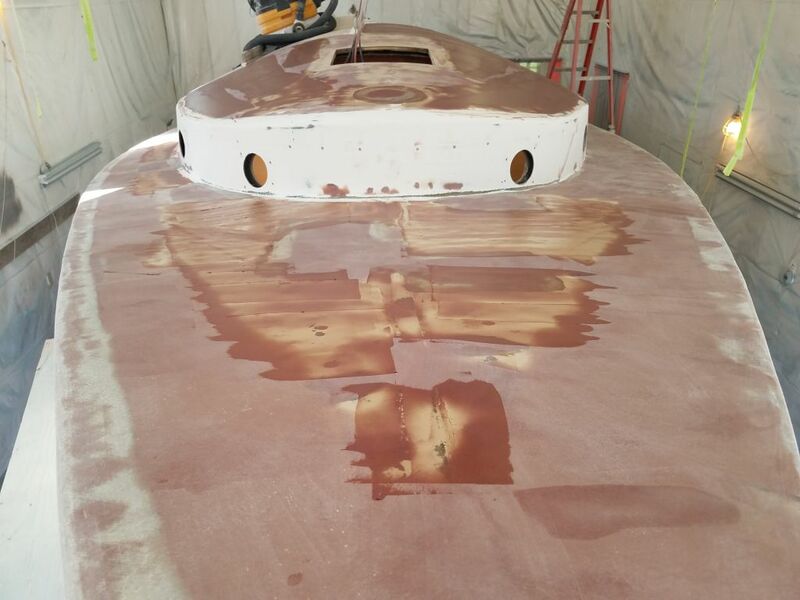 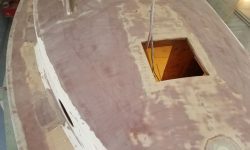 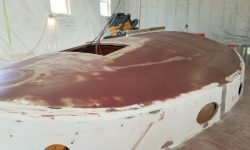 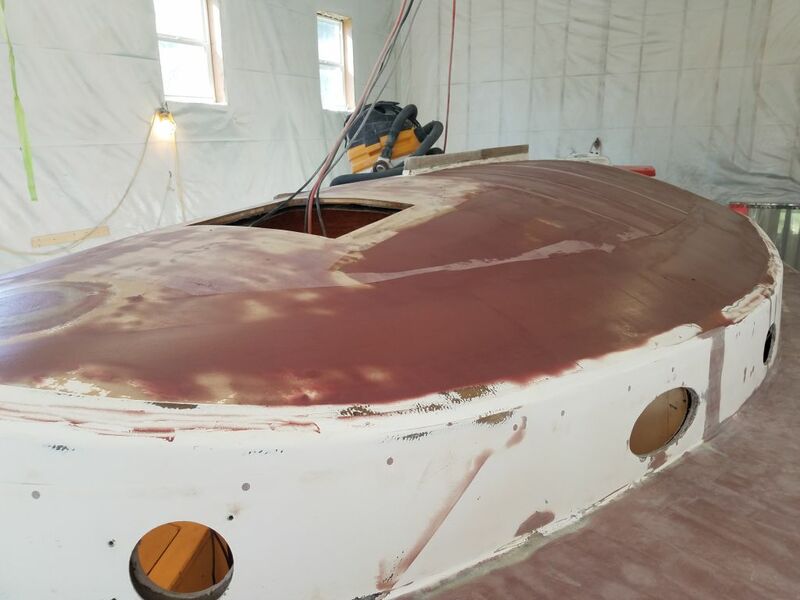 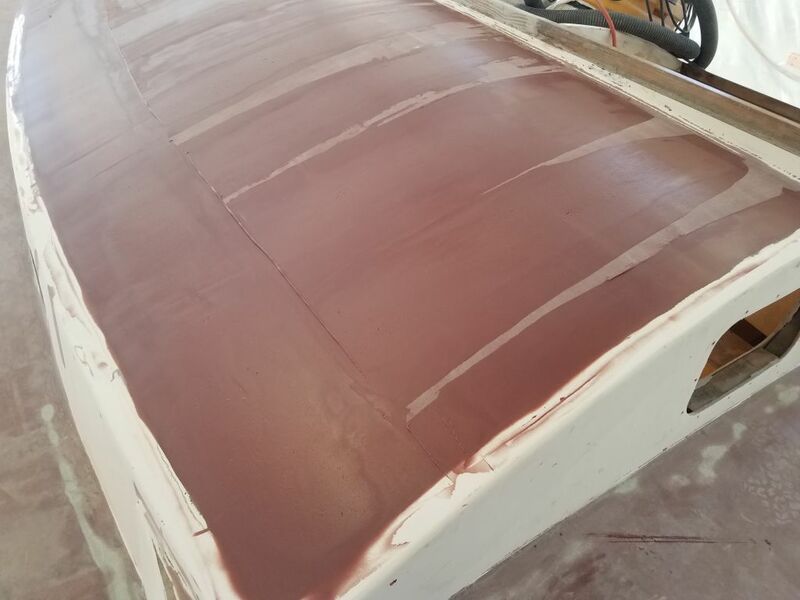 Finally, I skim-coated some remaining areas of the main deck, notably the foredeck and portions of the starboard deck, to help smooth the remnants of the old molded nonskid pattern and fill some additional small voids.